Body parts are soothed with the massaging action of the PDC Spa therapy system. Tense shoulders and back muscles are treated with a deep tissue, powerful massage jet action. Adjustable hot tub jets beneath the soft pillow headrests melt neck tension and minor backaches, often caused by daily stress. Thighs, hips, and feet are comforted with a variety of water motions and strengths. As most PDC Spas hot tub jets are interchangeable, the massage action can be entirely customized to deliver the best massage action for you. Each and every hot tub model by PDC Spas features unparalleled seating design comfort. The signature Recliner in several models, much like a Captains Chair, relaxes the entire body from neck to feet. Lounges for the tallest to the smallest of users cradle with just the right back support and knee angle to enhance your hot tub time. 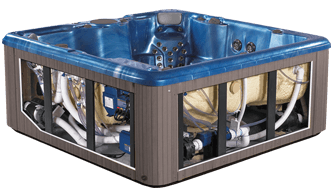 Contoured buckets, deep bench seats, wide open corner seats, and armrests make any one of the PDC Spas hot tub models perfect for you. The youngsters and aging couples alike recognize the natural benefits of a warm water soak. From splashing to water games to the deep tissue massage and joint pain relief, a hot tub or swim spa adds a new dimension of pleasure to your lifestyle. Take a moment for yourself, feel better, sleep better, have that long awaited conversation there never seems to be the right moment for. You may discover this is the best investment you have ever made for yourself and yours. Relaxing in a hot tub, enjoying the natural effects of warm water hydrotherapy, offers endless benefits to the body and spirit. Lay down the phone, turn off the TV and take a few moments just for you. Step in and settle back letting the warmth surround you. Relax, as the stress and tension of the day fade away. A PDC Spas hot tub is like a vacation at home, always warm and ready for your relaxation. PDC uses the finest raw materials to produce one of the strongest shells in the world, backed with a 35 year structural warranty. The finest acrylic sheet, Lucite brand continuous cast acrylic, begins the molding process in a wide selection of high-gloss, marbleized, and textured finishes. This outer spa layer is the most durable, easiest to maintain, and scratch resistant surfaces available. Backed with multiple layers of hand-rolled fiberglass and non-filled resins, this age-old, tedious process is what makes PDC Spas so strong that they can actually stand on their own with no framed support. Other companies rely on foam-cavities for additional reinforcement, but at PDC Spas we have proven that it is far better to engineer a solid thicker shell wall sustaining thousands of pounds of water and spa users. Although this process is far more costly, PDC Spas can guarantee an exceptionally strong spa shell built for decades of warm water relaxation. With five decades dedicated to building the best spa value, PDC Spas adds detail to design to make your spa experience truly enjoyable. Efficient Design for Economical Servicing - From the bottom up, PDC Spas assures your unit is protected from cold temperatures and unwanted outside elements. A three-layered floor construction includes a tough ABS plastic which seamlessly covers the entire bottom, wrapping upward onto the cabinet sidewalls. A thick layer of foam insulates for temperature control while the wooden layer provides strength and rigidity for a unit that is both energy-saving and durable. An inside reflective thermal barrier ensures outstanding thermal efficiency. 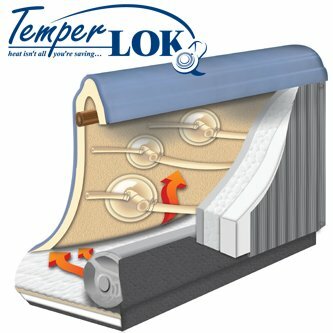 PDC Spas TemperLOK™ insulation system provides maximum energy savings while maintaining a lightweight unit for easier installations. The use of a strong fiberglass, non-filled resin backing with an insulating foam coating provides maximum strength and efficiency. Using this process, a PDC Spa is more costly to manufacture, however each and every PDC spa unit is made with quality and efficiency in mind. You can rely on the PDC Spas digital control centers to operate your spa flawlessly with their advanced technology and easy to operate features. Customize your spa operation with programmed ideal temperatures, filter cycles and pump performance for a worry- free, easy to maintain hot tub. The Pristine™ filtration system uses the suction-side of the jet pump to pull water through the filter for a deep cleaning. The deep pleats in the filter cartridge capture debris, dirt and contaminants, returning water polished and clean for your enjoyment. Reliable and virtually self maintaining, Pristine™ filtration effectively and efficiently assures water is clean and sanitized for relaxation anytime you choose. Standard on LifeStyle Series, Vitality and Synergy swim spas. After the simple start-up procedure is done you are ready to enjoy your in.Clear. Fill your spa with water, add the convenient BromiCharge™ and the in.Clear takes care of producing bromine sanitizer. Adjustments to the bromine level are made right at the keypad. You don’t need to wonder what chemicals to add — once installed, the in.Clear generates the proper amount of bromine for your spa. And since bromine is more efficient at a wider range of pH levels and at much higher temperatures than chlorine, your spa will be crystal clear and ready to use, without any other products. Lights are the ambience of relaxation, so set the mood with our unique lighting systems. 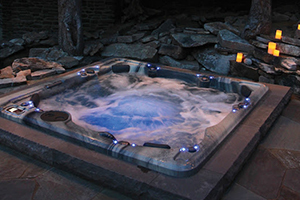 Each of our hot tub lighting systems enhances your spa atmosphere, illuminating your backyard oasis. Simple convenient fingertip control from your digital control center for a totally encompassing evening of relaxation and comfort. PDC Spa units are not only efficient to operate and dependable for years, but simple to service and maintain. 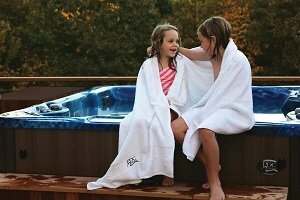 Contact us at PDC Spa And Pool World or stop by our amazing spa showroom where we have a great selection of spas on display, the finest saunas, top of the line above ground pools and a large selection of parts, supplies and accessories for al of your needs.